WinMoDof is a free application for photographers. 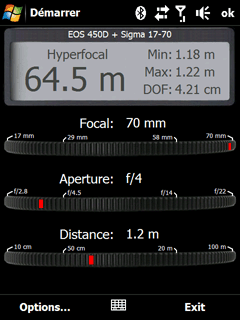 It is useful to calculate the depth of field according to the equipment, the camera settings and the focus distance. The user interface has been designed to be finger controled and its goal is to allow the user to access as fast as possible to the needed information. What is new in version 1.6? 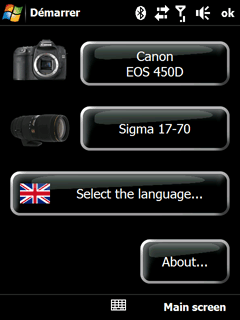 - Add possibility to switch between Hyperfocal and DOF on the main screen by clicking on it. Works very well on my Treo 700wx WM6 square screen! Even has my "Dinosaur" Minolta DiMAGE Xt in the list! contrary to post before: works perfectly on HTC HD2. do not work with the htc hd2!